Perspective view of the Platinum 2.4mm Horseshoe Scallop wedding ring. Handcrafted in our Hatton Garden workshop. Book an appointment at our Hatton Garden jewellers today. Floor view of the Platinum 2.4mm Horseshoe Scallop wedding ring. Handcrafted in our Hatton Garden workshop. Book an appointment at our Hatton Garden jewellers today. Front view of the Platinum 2.4mm Horseshoe Scallop wedding ring. Handcrafted in our Hatton Garden workshop. Book an appointment at our Hatton Garden jewellers today. Perspective view of the 18ct Rose Gold 2.4mm Horseshoe Scallop wedding ring. Handcrafted in our Hatton Garden workshop. Book an appointment at our Hatton Garden jewellers today. Floor view of the 18ct Rose Gold 2.4mm Horseshoe Scallop wedding ring. Handcrafted in our Hatton Garden workshop. Book an appointment at our Hatton Garden jewellers today. Front view of the 18ct Rose Gold 2.4mm Horseshoe Scallop wedding ring. Handcrafted in our Hatton Garden workshop. Book an appointment at our Hatton Garden jewellers today. Floor view of the 18ct Yellow Gold 2.4mm Horseshoe Scallop wedding ring. Handcrafted in our Hatton Garden workshop. Book an appointment at our Hatton Garden jewellers today. Front view of the 18ct Yellow Gold 2.4mm Horseshoe Scallop wedding ring. Handcrafted in our Hatton Garden workshop. Book an appointment at our Hatton Garden jewellers today. Perspective view of the 18ct Yellow Gold 2.4mm Horseshoe Scallop wedding ring. Handcrafted in our Hatton Garden workshop. Book an appointment at our Hatton Garden jewellers today. The Wave Scallop Set Diamond Wedding Band has a 'U' shaped profile to contour perfectly around an engagement ring. 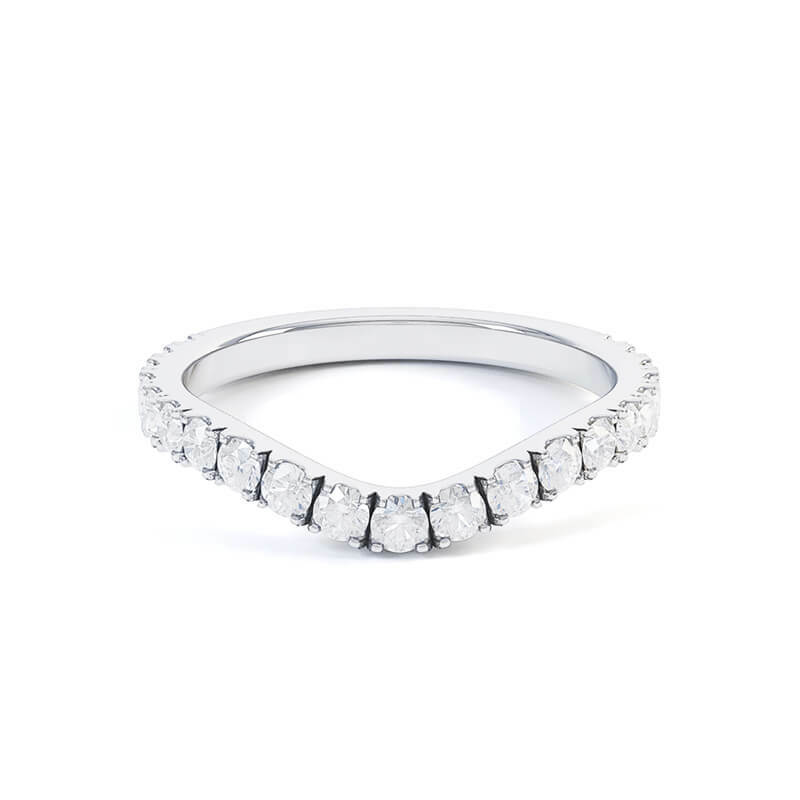 The band comprises closely spaced Round Brilliant Cut Diamonds that follow the contour, each held by four claws with an etched border to maximise light into the stones and create the illusion of an invisible setting. Our wedding bands are made-to-order in our Hatton Garden workshop based on your ring size and width preference. Platinum, Palladium, Rose Gold, Yellow Gold, White Gold. 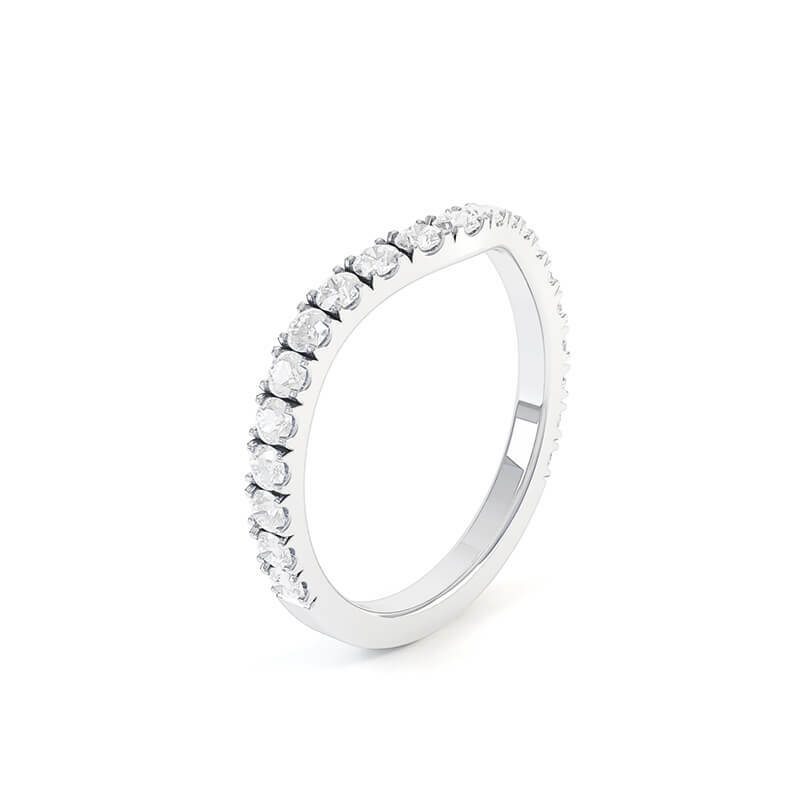 The price of your ring will depend on your choice of metal, ring size and width of the band. All prices are indicative and include VAT. Please note that Contoured wedding bands have a £150 fashioning surcharge.